December | 2010 | WHAT A FEELING! With all of this, does it really matter about the movie? Probably not, which is just as well: Dream a Little Dream is another personality-switch movie. An old guy (Jason Robards) figures out a way to move his spirit, which he thinks will bring happiness to him and his wife (Piper Laurie). Instead, his mind is transferred to a high-schooler (Corey Feldman), through whom he sees things anew. Not all that much happens; the kid romances a gorgeous girl (Meredith Salenger), freaks out his puzzled parents, and startles Robards’ best friend (Harry Dean Stanton). There is some suggestion that the director, Marc Rocco, had in mind that the lessons of the film be a bit more complex than the usual teen-genre simplicity, but not much. The movie has one remarkable sequence, the mind-transference routine. At night, Robards and Laurie stand in their backyard and perform some voodoo, while Feldman sprints through the cluster of alleys and yards and Salenger rides her bike through the streets, about to collide. On the soundtrack is Van Morrison’s “Into the Mystic,” and a dreamlike quality pervades. The scene is much too good for the rest of the movie, quite bizarre and out of place, but it suggests that this director might make an interesting film someday. Oh yes, the other Corey. Haim plays Feldman’s best friend, and does yeoman’s service. For now, the twin dynasty continues, but I hope these boys remember the fates of Bobby Sherman and David Cassidy. The mind-transference scene is an example of something I love about movies. I saw this movie when it came out (obviously), and haven’t seen it since. It’s not very good. But that scene continues to pop into my head from time to time—it plays around with moonlight, and dreaminess, and I think the wind is blowing through these small-town backyards (at least that’s the way it plays in my mind); plus Van Morrison’s great song does its magic thing. I also really love the spectacle of running when depicted in movies, and here that movement bespeaks youth, especially next to the age embodied by Jason Robards. And all this in a dumb movie with the Coreys. Marc Rocco was indeed interested in things beyond this sort of film; he made Where the Day Takes You, which aspired to grittiness and seriousness, and Murder in the First. The adopted son of character actor Alex Rocco, he died in 2009, before he was 50. 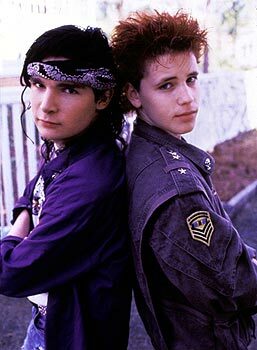 Corey Haim died in 2010, at age 38, having been broken many years earlier. As for the title song, the best cinematic use I can think of right now for this great standard comes at the end of Dominik Moll’s Lemming, a movie I have a weakness for. There it fits just right; here, not so much. 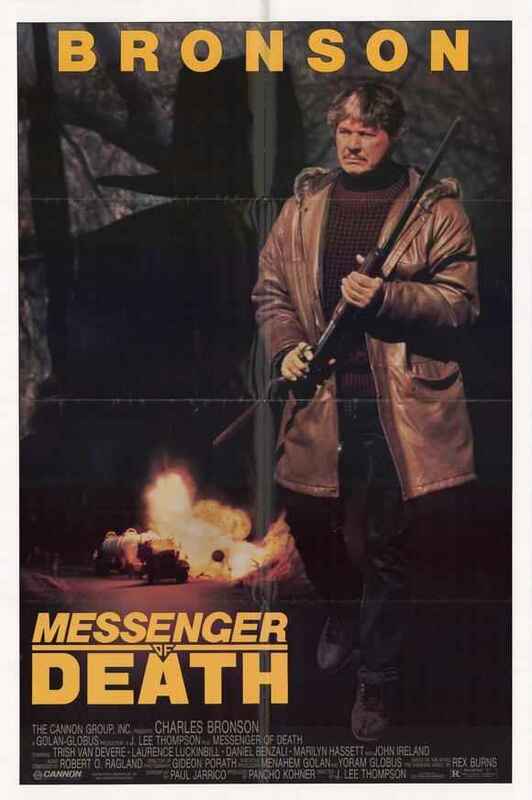 Charles Bronson varies his formula ever so slightly in Messenger of Death, in which he plays a reporter out to discover who slaughtered a family in rural Colorado. The fact that the movie is set outside of the big bad city is one step away from Bronson’s Death Wish routine, and the fact that he’s not playing a retired hit man lured out of retirement is another. The murder is related to an extremist Mormon family that believes in blood atonement, a policy that allows murder to be very much in the air. Which, for a Charles Bronson movie, is a pretty good place for murder to be. Apparently, the massacre that opens the film, in which a houseful of women and children are gunned down, is the result of a family feud between warring, wigged-out polygamists, whose Old Testament cragginess echoes the Colorado hills. But, having established this juicy stand-off, the film kills off the two patriarchs. With this exotic religious element gone, the film degenerates into the same old Bronson shoot-’em-up, with our man exhibiting his usual invincibility. Not only does Bronson evade all bullets sent his direction, he also navigates a little pickup truck between two thundering 18-wheelers that are trying to make a highway sandwich out of him. After the initial intrigue with the Mormon business, the film becomes as perfunctory as Bronson’s standard (veteran J. Lee Thompson, a regular collaborator in Bronson’s last, sleepwalking decade, directs). Bronson’s love interest, for instance, seems to be split between a fellow reporter and a small-town publisher. But, having set up certain possibilities with these two women, the movie proceeds to ignore them. Just killing time, it turns out, between those dull spots when Bronson isn’t beating somebody up. First published in the Herald, 1988. When I think about reviewing movies in the 1980s I think about driving up to the Aurora Village mall or some other awful suburban movie-showing venue in order to see a Charles Bronson picture. I like Bronson everywhere else, but in the Eighties—hoo boy, with a couple of exceptions, it’s a trudge through diminishing budgets and spirits. It didn’t take long for the first Gremlins rip-off to appear. A scant seven months after the big summer hit opened, we have Ghoulies on our hands (and other places too, if you believe the ad campaign). Weird thing is, Ghoulies doesn’t have too much to do with those ghoulies, who are creepy little gremlinesque creatures. They seem to have been added as an afterthought. The film is primarily a witchcraft story, and the ghoulies are conjured up in the process. The baby is whisked away and cared for by the groundskeeper of this evil mansion. Cut to 20 years hence, as two young people walk around the grounds of the same mansion. “I still can’t believe you inherited this place,” says the woman to the man. How’s that for graceful exposition, folks? Yes, the man is the same kid who was almost killed. When the pair moves into the mansion, he becomes obsessed with recreating witchcraft rituals. He even starts whispering Latin chants while he’s making love to his girlfriend. Which is, understandably, too much for her. She checks out, but he beckons a batch of ghoulies (and a pair of dwarves) from the dark world to keep him company. His eyes turn green, too, so he starts wearing dark glasses when company comes over. His friends don’t really notice any difference. But then, they’re just around to provide comforting stereotypes: two cute gals, dumb slab of beefcake, nerdy brooder and two dopeheads. With best friends like this, who can blame the guy for turning to witchcraft? Ghoulies is boring, boring, boring. Although it clocks in at just 75 minutes, it seems to take forever to get going. The movie is already dead and buried by the time the ghoulies arrive, halfway through. But the ghoulies are secondary to the story of the dull hero. Lisa Pelikan, who plays the girlfriend, may have the prettiest shoulders in Hollywood, but she doesn’t really get to contribute very much. The only historical footnote of interest is the presence of Jack Nance, who played the main character so memorably in David Lynch’s Eraserhead. Here, he plays the groundskeeper who hustles the little kid away. He also does battle with the Evil One late in the film—down in the basement of the mansion, where much of the action takes place. His name is—what else?—Wolfgang. 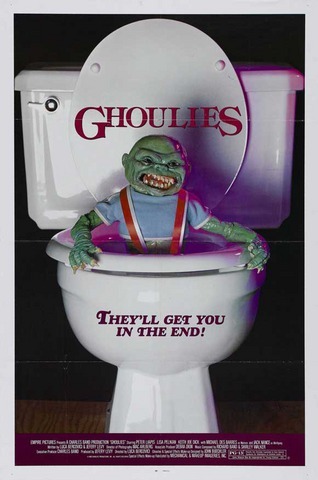 The ad (see above) had a ghoulie popping out of a toilet—a promise of unsavory hijinks that might explain how the movie came to be a modest independent hit. (Even more unsavory: the font choice on that poster.) I don’t recall a single image or event from this movie, so that’s all I can say. However, it did spawn, as they say, three sequels, as halfway-successful horror films will tend to do, but the subterranean world that would contain Ghoulies sequels is not a place I can be. Surprise! It’s not that bad. The prospect of Barbra Streisand wearing the hats of director, producer, star, and co-screenwriter, and not making a movie that was relentlessly overbearing and self-righteous, seemed slim indeed—to this admittedly biased reporter, anyway. The last time La Streisand wielded that kind of control (she was essentially, if not nominally, the auteur of that best-repressed 1976 A Star is Born) the results were shrill—in particular, her onscreen presence was more insufferable than ever. She appeared to seize the opportunity for unobstructed self-expression as a vehicle for venting her pet peeves about the press, the execs, the agents, and even her yammering hordes of fans. That’s not what Yentl is about. It’s clearly a labor of love, and Streisand, perhaps sobered (one hesitates before using the word humbled) by the knowledge that there won’t be anybody else on which to blame this one, has displayed some restraint. On the level of performance, she still gives the Broadway musical-comedy line readings that are so wince-inducing. But she manages to tell the story coherently—if slowly—and she cannily lards the film with genuinely humorous sequences. So, the old girl-dressing-up-as-a-boy routine has laughs built into it; okay, but Streisand shows an intuition for knowing when to tap the comic vein (I’m thinking of the wordless love duets with Amy Irving’s misguided character, for instance). Less successful are the songs—which are sung by Streisand’s character exclusively, and which function as narration or interior monologue. Maybe if you like Streisand’s voice, you’ll like the songs. I wouldn’t know about that particular predilection. But the Michel Legrand-Marilyn & Alan Bergman tunes are a pretty bland lot. And the songs necessarily pad out the running time, which is already long, and which, I’m afraid, seems long. The film’s denouement, for instance, takes up the last part of the movie and doesn’t seem as though it’s ever going to get fully explained; people keep repeating just what it is they’ll do in the much-altered future, etc. But if Streisand’s strengths as a director are not in the arena of rhythm, she does manage to capture a few moments—primarily people simply glancing at each other, thinking something about someone who probably, sadly, is not thinking the same thing about them. There’s a scene in which Yentl (Streisand), dressed up as a Yeshiva boy in order to gain an education (forbidden to women), is wrestling playfully with the older student (Mandy Patinkin) who has been her brotherly guide at school. She falls back on the ground, and there’s a close-up of her face against an obviously false patch of grass (we can assume from the Astroturf that they went to the special trouble of setting up this shot in a studio). As Patinkin looks down into her face, you can see that he’s starting to have some peculiar feelings about this beardless boy. Just then, we cut back to the close-up of Yentl, and just for a second you can see that the sunlight is starting to break over that face, and the false grass. In ways that are not always explainable, a moment like this is very satisfying, and it can almost excuse the pokey expositional passages, the occasionally strident women’s lib asides, and the musical snoozes. But then I’m always more inclined to indulge artists when they’ve gambled everything on a single project, as Streisand has here. It would still be all right with me if she decided to retire from the screen, but a grudging “Mazeltov!” seems in order anyway. Perhaps this didn’t come through, but I’m not the biggest Streisand fan. Having seen A Star is Born at least three times in theaters for various high-school related reasons, I still have songs such as “Queen Bee” and “Hellacious Acres” pop up in my internal jukebox from time to time, and the experience has taken its toll. I doubt I will ever see this movie again, but it was a pleasant surprise, with actual warmth to it. Streisand has not retired from the screen. “Hellacious Acres” on YouTube here. For one thing, the title is Santa Claus, not Santa Claus—The Movie, as the advertisements would have it. That’s a good sign, and this film bio of the jolly fat man in the red suit is a bit better than some of the sour advance publicity had suggested. Unfortunately, it’s still nothing great. The film, on which a reported $50 million was lavished, comes to us from the Salkinds, the millionaire film producers who created the Superman series. The structure here is similar to that of Superman: We’re shown how the hero’s legend was born, and then how the hero acquits himself in a battle against an evil foe. Santa Claus, as we first see him, is a kindly woodcutter who delivers toys to the children of his village. One night, during a howling storm on Christmas Eve, Santa (veteran character actor David Huddleston) and his wife (and their twin reindeer) are lost in the snow—and, in fact, seem to perish in the blizzard. However, a bunch of little elves come to the rescue the next day. Santa and the Missus are trundled off to a huge magical workshop, where he is instated as the deliverer of the presents. A half-dozen reindeer are added to the team, and they’re fed a meal of juiced-up hay, which allows them to fly at Santa’s command. And, for the final coup de grace, a wizened old geezer (played by Burgess Meredith, so you know he’s the soul of elfin wisdom) pulls his beard and decrees that Santa is now the toy-maker to the world. Fine. That’s the story of the legend, and the first half-hour of the movie. The rest of the film pits Santa against a mad villain (John Lithgow) whose toy company makes shoddy merchandise. This plot is more fun than the expository section—not least because Lithgow is chewing up all available scenery. He latches onto one of Santa’s wayward elves (Dudley Moore, looking sheepish throughout) who creates a puce lollipop with pixie dust that allows children to fly. 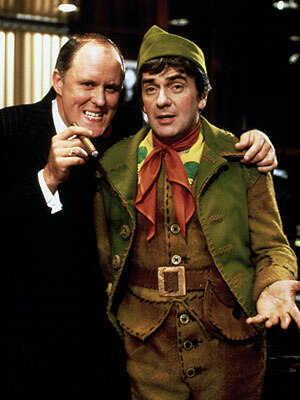 Lithgow gets to cackle and say things such as, “We’ll take the cash and let the elf face the music,” so he’s happy. There’s also some business about Lithgow’s good-hearted little niece and the tough street waif she befriends, but the less said about that the better. Santa Claus is handsome and well-mounted, but there’s a void of inspiration that prevents it from attaining the kind of charm that Superman had. Director Jeannot Szwarc (Jaws II, Supergirl) seems to have the soul of a businessman, and there isn’t a moment in the film that touches something magical. On the other hand, it is, at least, coherent—even when it’s borrowing. David Newman (one of the Superman scriptwriters) has kept more than just the structure of Superman; he even has a scene in which the protagonists giddily fly over nighttime Manhattan, just as Superman and Lois Lane did (Margot Kidder isn’t around to sing a song here, however). Newman fills the movie with familiar Christmas material (and, by the way, this is a secular Santa—no religious questions about the real meaning of Christmas). Elves dance and sing, happy in their work; Santa ho-ho-hos to his heart’s content; the reindeer eat their magic hay and mug for the camera. There’s enough of that sort of thing to satisfy younger children, no doubt about it. But if you’re old enough to be taller than Dudley Moore, you’re probably going to be underwhelmed. 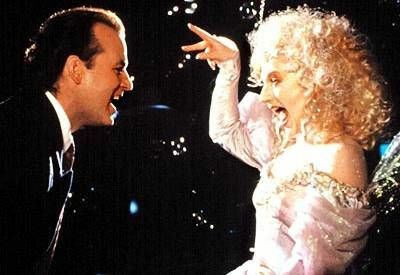 Scrooged looks suspiciously like the big movie disaster of the latter part of this year. It’s a big-budget package with a major star, Bill Murray, and an attractive concept: As the title suggests, this is a modern version of Charles Dickens’ A Christmas Carol. But this impressive package might have appeared to have too much going for it, because nobody seems to have gotten around to making a movie to go with the package. The package does have Bill Murray, who is one of the great comic actors of our time, in his first starring role since his 1984 tandem of Ghostbusters and The Razor’s Edge. But Murray is on his own here, heroically trying to make stiff lines sound funny, a manic cheerleader trying to get the crowd worked up when his team is losing by 50 points. 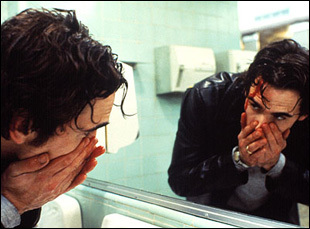 The screenplay is by Mitch Glazer and former “Saturday Night Live” sicko Michael O’Donoghue. It begins well, with some ferocious TV satire, as network president Murray unveils his offerings for Yuletide programming: a terrorist movie called The Night the Reindeer Died, “Robert Goulet’s Old-Fashioned Cajun Christmas,” featuring the singer in a swamp, and a live production of Scrooge, starring Buddy Hackett, with Mary Lou Retton as Tiny Tim. Murray’s a Scrooge himself, a greedy climber who fires one of his executives (Bobcat Goldthwait) just before the holiday and forces his secretary (Alfre Woodard) to work late on Christmas Eve. But in the midst of his meanness, he’s visited by a former associate (John Forsythe), who is now dead and residing below. The ghosts of Christmas Past (David Johansen), Present (Carol Kane), and Future cannot be far away. There are some funny bits in the movie, as when Murray sees supernatural visions while lunching with his unamused boss (Robert Mitchum). But there are too many long stretches between the good parts, and the ghostly visits are uninspired (Carol Kane’s role relies on the single, and irrelevant, joke of beating Murray to a pulp). Director Richard Donner (Lethal Weapon) doesn’t seem to have much feel for comedy. He shoots a disproportionate amount of the movie in close-up, an approach that emphasizes the pockmarks on Murray’s face and limits the comedian’s loosey-goosey, improvisational physicality. When in doubt, which appears to be frequently, Donner relies on Murray to scream a line reading as loudly as possible. For some reason, at the happy ending, someone decided that the entire cast should sing to the audience. It makes for one of the screwiest finales in recent memory, a smiley-face button tacked on to an otherwise appropriately nasty movie. Murray’s old film critic from “Saturday Night Live” would’ve trashed it. Scrooged has a following, I guess especially among people who grew up with it. When it comes to sideways showbiz-inflected adaptations of Dickens, I’ll take Mr. Magoo’s Christmas Carol every time. I sort of resent Murray for being so little in movies in the 1980s; after Stripes, he could have done anything, but his actual output is extremely slim. He came across as so gloriously free and untethered back then – a shambling monument to the subversive impulse – and it would’ve been great to have seen him more. Unless the movies were like Scrooged, in which case maybe he was right. You are currently browsing the WHAT A FEELING! blog archives for December, 2010.